Northern Masked Chafer (Cyclocephala borealis) and Southern Masked Chafer (C. lurida) adults are appearing around porchlights at night in southern Ohio. It is common for people to assume that white grubs found beneath turfgrass in Ohio are Japanese beetle (Popillia japonica) grubs. This is no longer a safe bet. 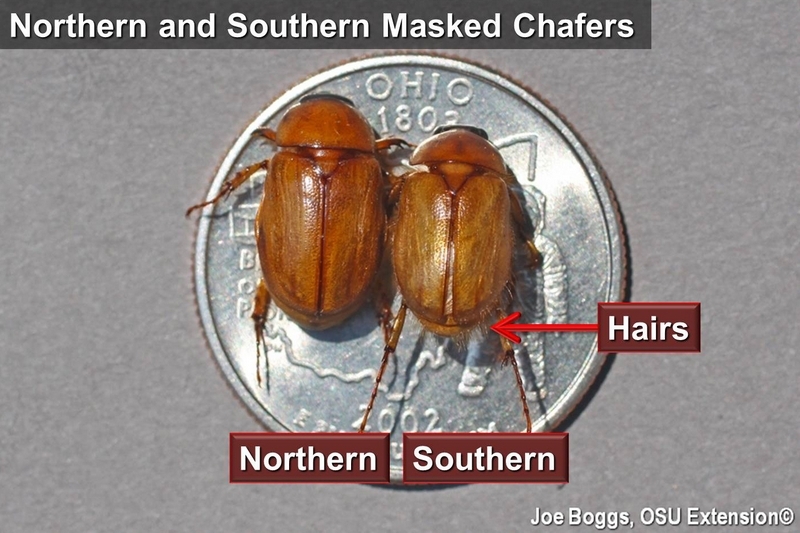 Japanese beetles have largely been replaced by these two chafers as the dominant "white grub producing" beetles in many areas of Ohio including the southern part of the state. Indeed, I asked an experienced lawn care company last season to collect white grubs so I could take pictures of Japanese beetle grubs. Despite a steady concerted effort, they only found masked chafer grubs. Part of the reason the great grub switcheroo may have gone unnoticed is because the masked chafer beetles operate below the radar: they do little to no noticeable feeding and they only fly at night. Of course, Japanese beetles are day fliers and are notorious for the leaf skeletonizing damage. Japanese beetles have also started to emerge, so it's too soon to know whether beetle populations will rebound; however, I'm already seeing a steady flow of chafer visitors to my porchlight.